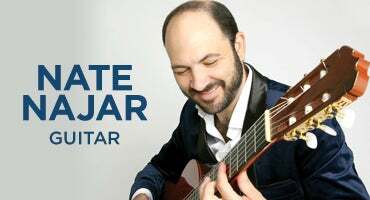 Like the legendary guitarist Charlie Byrd, Nate Najar plays fingerstyle on an acoustic classical guitar—bringing an elegance to everything he plays. But while Najar’s imaginative playing is steeped in Byrd’s tradition it also reflects a world of other artistic musical influences, including classical, bebop, fusion, bossa nova and post-modern, culminating in a player whose sophisticated and innovative artistry stands alone. His two previous full length recordings on Candid Records – including 2012’s Blues For Night People: The Nate Najar Trio Remembers Charlie Byrd – earned him accolades from critics and influential jazz voices alike. Rick Anderson of All Music Guide called Najar “one of the most consistently interesting and stylish young guitarists on the jazz scene.” A Nate Najar set might wander delightfully from standards like “Sidewalks of New York” to Chick Corea’s “500 Miles High” to a dash of Chopin…with audiences tagging happily along. 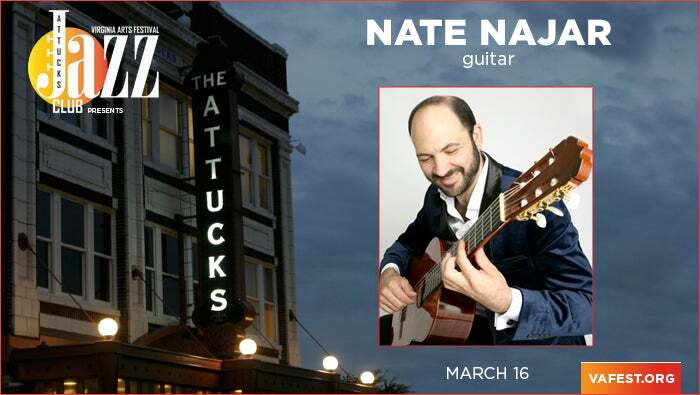 Consider this March evening at the Attucks Jazz Club an elegant reprieve from a noisy world: “Najar’s tasty note selection, delicate touch, and immaculate technique offer the listener a comforting refuge that keeps the outside world at bay” (Vintage Guitar magazine).